Moshe Cotel is a composer who lives in a noisy building on a noisy street in a noisy city. One day as he strolls down the street he finds a little kitten. He takes her home, telling her they will “make beautiful music together.” Truer words were never spoken. One day, Ketzel strolls down Moshe’s piano keyboard, Moshe writes down what he hears, enters the composition into a contest, and the rest is history! 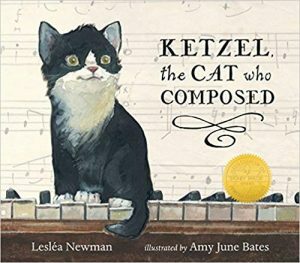 Based on a true story, Ketzel will delight both cat lovers and music lovers alike! A photo of the real Ketzel, which appeared in the New York Times. Moshe Cotel lived in the middle of a noisy building in the middle of a noisy street in the middle of a noisy city. But Moshe didn’t mind. Everything he heard was music to his ears. Moshe was a composer. Every morning he composed himself by sitting very still and listening outside himself and listening inside himself, just as his teacher had taught him when he was a little boy. When he was done listening, Moshe turned all the wonderful sounds he heard into beautiful music. When Moshe was finished working for the day, he went out for an afternoon walk to listen to the sounds of the city. On this particular day, he turned a corner and heard a sound he had never heard onf the street before. It was a small sound. It was a sad sound. It was a…. Composer Moshe Cotel lives in “a noisy building in the middle of a noisy street in the middle of a noisy city,” but everything is music to his ears. One day, he hears a new noise: a frightened kitten mewing. 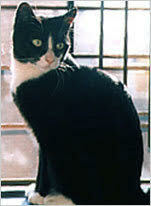 He names her Ketzel—Yiddish for cat—and takes her home, where she spends happy hours listening to Moshe playing piano. An announcement of the Paris New Music Review’s contest arrives in the mail, calling for compositions of 60 seconds or less. Moshe finds this impossible until Ketzel creeps across the piano keys and plays a lovely tune with “a clear beginning, middle, and end.” And it’s only 21 seconds long! “Piece for Piano: Four Paws,” by Ketzel Cotel, wins special mention in the contest. When Moshe and Ketzel appear for its debut, no believes she wrote it, but “Four Paws” becomes famous, even earning her $19.72 in royalties. Based on a true incident, this delightfully told story is unlikely and adorable in equal parts. Bates’ watercolor, gouache, and pencil illustrations feature an un-anthropomorphic kitty whose inquisitive and quizzical nature will be familiar to all cat owners. The author’s note offers all the answers readers will want. An absolute charmer! Here’s a lovely tale of cross-species affection and creativity, based on a true story (recounted in an afterword). While seeking inspiration in the busy streets of New York City, a composer and pianist named Moshe Cotel finds and adopts a stray kitten, bestowing it with the Yiddish name Ketzel (for “kitten”). Ketzel proves more than a companion: when Moshe needs an entry for a music competition restricted to pieces no longer than one minute, the kitten steps in and composes a piece by walking across the keys (Moshe dubs it “Piece for Piano: Four Paws” and gives her full credit). Newman’s great affection for her subject is evident, yet she never crosses into cutesiness or sentimentality; her reportorial tone is a perfect match for her down-to-earth, generous hero. Bates, working in hues of parchment and gold, produces some wonderfully warm vignettes, pushing the graceful realism of her watercolor, gouache, and pencil drawings just enough to add a glint of magic to a story that’s already one of a kind. A cat strolls down a piano keyboard and saunters into musical history. Composer Moshe Cotel finds a stray kitten near his home and dubs her Ketzel, Yiddish for “little cat.” One day a letter arrives, announcing a contest for a piece lasting one minute or less. Moshe toils away at his piano, but nothing he composes meets the time limit, and he gives up. Aiming to pounce on the grievous paper—Ketzel just knows it’s causing her guardian’s distress—she walks across the keys to reach the table where the letter lies. Little does she know what she’s wrought. Moshe is astounded by what he’s heard, immediately reproduces the notes on paper, and mails the “composition” off. In time another letter arrives—congratulating Ketzel on her award of “a certificate of special mention” for her “creative instinct and imagination.” There’s more: “Piece for Piano: Four Paws,” will be performed! News of Ketzel’s extraordinary achievement spreads, and she receives a royalty check that buys a bounty of cat food. This adorable account is as warm and fuzzy as Ketzel herself and all the sweeter because it’s based on fact. The watercolor, gouache, and pencil illustrations suit the text perfectly, delightfully capturing Ketzel’s furriness, the story’s charming, lively energy, and Moshe and the “composer’s” loving friendship. Truly, the cat’s meow. Musicians and cat lovers alike will enjoy this charming picture book based on a true story. Moshe Cotel, a young composer, lives alone in a busy, noisy city but “Everything he heard was music to his ears.” One day he discovers Ketzel, a tiny black-and-white kitten, on the street. He holds her tenderly to his chest and declares, “I will take you home, and we will make beautiful music together”—prophetic words, to say the least. When Moshe receives a letter from the Paris New Music Review about a contest to write a composition of 60 seconds or less, try as he might, he is at a loss. Then, Ketzel creeps across the keyboard, inadvertently accomplishing what the composer could not. “Moshe grabbed a pencil and jotted down exactly what he’d heard…. ‘Your composition has a clear beginning, middle, and end, is full of heart, and takes exactly 21 seconds to play. Ketzel, you’re a genius!’” The feline’s “Piece for Piano: Four Paws” wins an honorable mention, and its furry composer actually attends a performance. The watercolor, gouache, and pencil illustrations depict a busy city, a sympathetic bearded musician, and a simply adorable protagonist. Verdict: A delightful read.